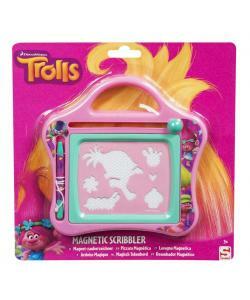 Get ready for some doodling fun with the Trolls with the Trolls Magnetic Scribbler. Comes with a template sheet to create Trolls shaped silhouettes. Hours of fun with no mess. The Trolls Magnetic Scribbler is perfect for any little fan of the popular film Trolls. This easy to hold scribbler is perfect for keeping your little ones entertained at home as well as on the go during long car journeys, as they can explore their creativity without any mess. This magnetic scribbler also comes with a template sheet to create Trolls shaped silhouettes!